It’s been a while since my last post and I’m sure time disappears down a black hole?! Lots have been happening in my life, least of all, I’ve been nursing a broken toe. It’s the first bone I’ve ever broken in my life and it’s interesting how something as small, and seemingly as insignificant, as a broken little toe can have such a dramatic impact on the rest of the body. Not only do I keep catching it on corners of boxes, chair legs, bed legs, which is extremely frustrating … and painful; it has compromised my balance and as I’ve carried on teaching my classes to the best of my ability, it’s now affecting my entire body. Yes, yes, yes … I know! My body’s screaming at me and the universe is conspiring to tell me something. Isn’t it funny how we tend to bulldoze our way through life and ignore the signs and messages that are all around us. I do have to laugh at myself where my toe is concerned. Not only did I break it over 6 weeks ago. I re-broke it just over a week ago AND dropped the kitchen knife on it! I think the universe has given up whispering to me and decided to send me several massive slaps in order to listen! As I’m sure with you, the roller coaster ride of life sometimes hits harder than others and I’ve been riding the wave over the past couple of years that I guess, … no, I know, that I need a break … literally, so hence, my broken toe! My body, mind and spirit, as they do, have been quietly whispering to me to slow down. Whilst deep down I hear the whispers, I have chosen to ignore them. So, I’m now halfway through a busy month with my Les Mills work and as I’m committed, I will see the work through and roll on a holiday next month!! What I have realised is that apart from ignoring the whispers, I’ve been in a constant state of tension; where my body is tight and closed in. 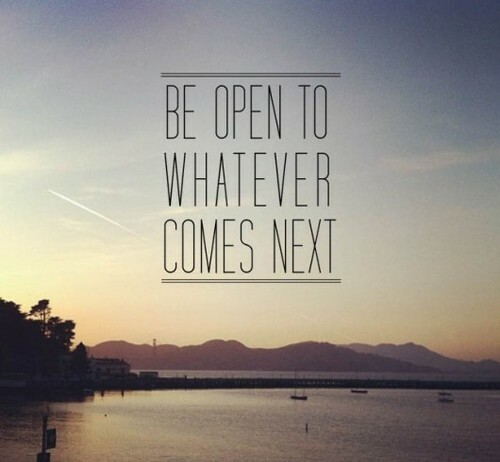 Hence the theme for yoga this month is be open. When the body and mind are relaxed, our ability to respond is sharper and quicker. Not only that, being open in our mind and heart could mean that instead of swimming upstream, we move steadily with the flow of life and are accepting of what life has to present; new ideas, different roads to venture along. So, are you listening to the whispers of your soul? When you feel yourself tightening and resisting, take a breath and remind yourself to soften and be open.